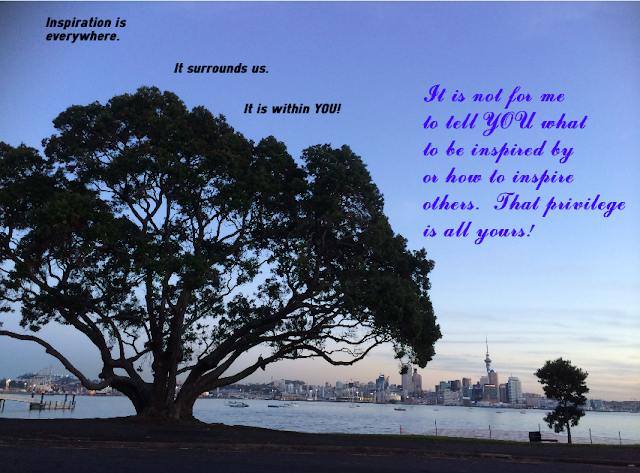 The last three weeks have been busy in the 'blogosphere' with the #EdBlogNZ challenges. One of this weeks tasks is to write about what have been my top three sources of inspiration over the last three weeks. It almost feels like a trick question. This was my first ULearn conference. I was fortunate to have been able to bring three other staff members from our Innovations Team with me. What struck me most was how good ULearn is for people in all aspects of education. There was something there for everyone. It was a great opportunity to network across the sectors; with leaders, facilitators, teachers, industry players and international speakers. It was also reassuring to hear the stories of other schools that are not that different to us, and that the innovative things we are doing were on the right track. It was particularly gratifying to hear stories of schools that were not brand spanking new and well resourced in a way that single cell older schools such as mine, are. Even better, it is powerful for our teachers to hear those stories. I think what ended up being most inspiring about ULearn for me is that we have teachers and systems and innovative stories that we can share, and all going well, we hope to have the opportunity to present at future ULearn conferences. Sometimes you need to see and hear the journeys of other settings to appreciate the work you have done within your own. If such a thing as an educational crush exists, then it would be fair to say I have one for Grant. It was a real highlight for me to meet Grant face to face, and he was one of the reasons I signed up for ULearn in the first place. His book #EdJourney has been one of the highlight reads for me this year. To be able to travel around visiting other schools and highlighting the fabulous things that are happening in the educational world (as opposed to constantly hearing how bad things are) is a real privilege, and the fact that Grant has done this is inspiring. It is on my educational 'to do' list to travel around uncovering best practice one day (any potential funders out there - I am open to discussions!!) and to read Grants book, then meet him in person, is a little like living vicariously through that! I would post a pic of the evidence of meeting Grant and his lovely wife, but in the excitement it wasn't taken with my camera! Twitter is one of - if not the - best PLN (professional learning networks) I have ever been involved in. If you have yet to embrace it, then you will just have to trust me when I say - it is outstanding! I wonder how transformational my own career would have been if I had been able to access such a rich and varied network right from graduating! If it had been available (along with Pintrest) when I was a beginning teacher who knows what could have happened! (yes, I am older than you know) I have always believed in the power of collaboration and networking, and this must be the most powerful. I have access to smart, innovative, and thought provoking educationalists from around the world. The best thing for me is that the educators I connect with are happy to debate, challenge, question, and share - and not one of them is bothered about the fact I am an educational leader. No one couches what they say because they think I might not 'like it', there are no perceptions of control and power, and often times the debate is rigorous and thought provoking. When I can I try to participate in twitter chats from around the world because understanding the challenges and differences of a world wide system helps me better navigate the one I work in. Most importantly, a highlight for me at ULearn was meeting up with the real people who sit behind the twitter handle. The Twitter Dinner was a really good opportunity to talk without being limited to 140 characters! The only downside for me was the worry that my online presence is far more engaging than in person! Twitter really is an ongoing source of inspiration and if you have yet to embrace the 'twitmosphere' then all I can say is go for it - you never know what magic might come from it! Inspiration can be found anywhere, anytime and it can take many forms. I have been particularly inspired by the three things above, but in reality, being an educator, working with teachers, students and the community means inspiration can strike at any time. The real challenge is how we might inspire others! If you find the answer to that - drop me a line. Guest Post - To Korero Or Not?